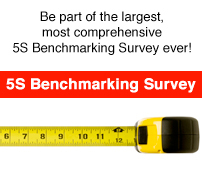 I would like to thank all those who participated in our first ever 5S Benchmarking survey; we had over 300 respondents. This one-of-a-kind survey will shed some light on our collective 5S practices. We look forward to sharing the results and best practices discovered soon. Rhonda Kovera, Visual Workplace, Inc. Without the help of these people and their organizations, we would have never been able to make this 5S Benchmarking Survey a success. If you didn’t get a chance to participate this time, stay tuned because we may do this again in the future!